A hole in the wall literally, SR Grant & Sons is a hidden gem on Commercial Street that is stocked with ceramics and crockery for home sweet home, and prices start as budget as INR 20. Around for about 60 years, we must’ve walked past SR Grant & Sons a bunch of times without realising the treasure that it really is. The tiny store has quite the collection of crockery and ceramics and at great prices, for those of us trying to set up the kitchen on a budget. 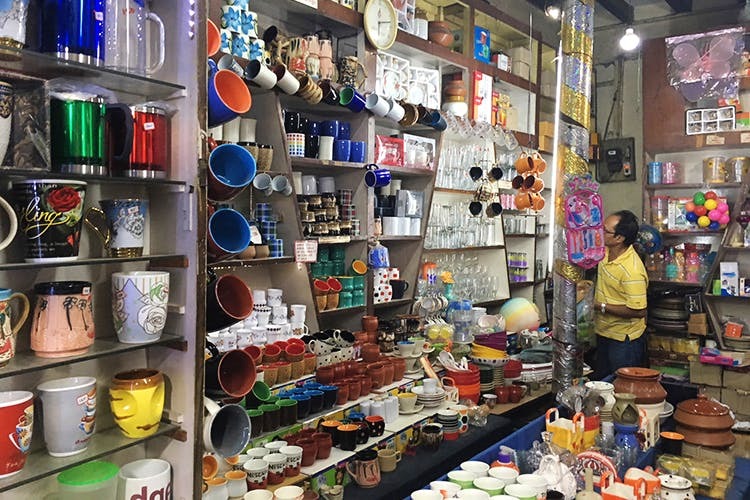 With a wide range of ceramic mugs, some of which are even hung on the doors of the store, you can find pieces at just INR 20. Available in different sizes, colours and patterns, and even in sets of six, their cups will make you want to throw a tea party right away just to show them off. Don’t worry, these are microwave safe and you can find ceramic plates, bowls, cutlery holders and old-school pickle jars too. And the list doesn’t end with ceramics. You’ll come across glassware, melamine plates and dinner sets as well. Being a small space, there's crockery hiding in every nook and corner. So you’ll have to nose around a bit to find what you want. We spotted some lovely earthenware mugs and pots that’ll look great on the dining table. All in all, there are many hidden treasures to discover and SR Grant & Sons, so make sure you check them out on your next trip to Commercial Street.